TeacherCalder – Page 4 – Teacher by trade. Learner by nature. Most money spent on iPads in education is spent on purchasing LEARNING devices. iPads for student use in class. This is where the biggest impact on learning can happen. However, many teachers are getting their hands on iPads for teaching that they can personalize and set up for themselves. While this most directly impacts teaching, it can have great impacts on student learning as well. We needed something to get our class back working together as a cohesive unit today. Yesterday we had an amazingly awful run of things trying to get text-to-speech tools installed and running on all students devices. It was chaotic, crazy and frustrating for many of us. We had planned on starting with Scratch next Monday, but needed something exciting and fun to end the week on a positive note. Wow, did that plan work! Practice skills required to learn new things. Develop critical thinking skills required to troubleshoot when things don’t go as planned. What can you do when something doesn’t work? Develop collaboration skills. 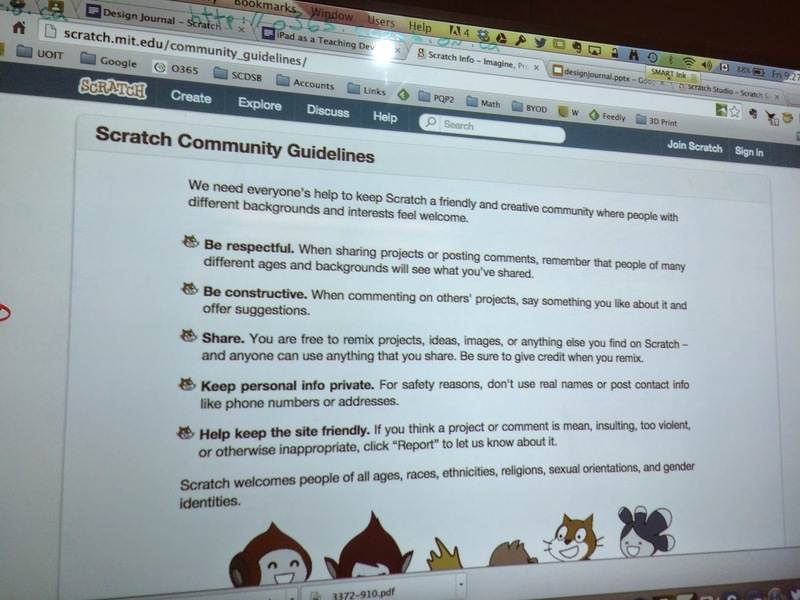 Students can build together, learn new features from each other, build on each others code. Practice critiquing each others work and providing effective feedback for improvement. Reflect on what it means to have “grit” or resiliency. How do we respond and feel when things don’t go as planned? Develop skills for creativity and innovation. How can you make this piece of work even better? Provide context and practice of some literacy skills. We will be keeping design journals as we go. Provide context for reflection on learning skills. Provide a real virtual community to practice and demonstrate our digital citizenship skills in. These skills will include appropriate communication, sharing our work, remixing others work while providing credit. We had great conversations about “the Grandma rule” (don’t post anything online that you don’t want Granny to see). We also talked about the skills required to troubleshoot when technology goes wrong and what it means to tinker and figure things out on our own. Todays class was the most engaged I have seen my students by far. It was also the most collaborative they have been, with exception of previous “directed” group work. Meaning, they were all up and learning over each others computer screens, helping each other out and interacting with each other. Mission accomplished. A great end to the week. Next week we’ll each find a feature to share with classmates. This summer I found myself reading (or rather, listening to the audiobook) Fullan’s Six Secrets of Change. As I was mowing the lawn, or driving, or walking the dog to this book, my mind kept making connections to the change in our school culture over the past year as we moved into 1:1 BYOD Blended Learning (every Grade 9 brings a laptop or tablet to school). The shift in culture in the school has many factors most certainly. However, if you look at the shift in professional development over the past year you can see connections to each of Fullan’s secrets. I think this is just common sense? This past Thursday we held our Grade 9 Orientation day. A great group of teacher and student leaders led the grade 9’s through an “Amazing Race” of stations, including getting their devices connected, scavenger hunts through the school and SPARK activities. Since I’ve started working at MSS, there have been two major questions that have helped guide our work. How can periodic, short exercise breaks help student well-being both physically and mentally? How can the use of student devices support the development of creativity, critical thinking, communication, citizenship, collaboration and character education? While these goals may seem at odds, I believe that they are important to consider together. Balance is needed. There are a group of amazing educators in our building who have helped the rest of us integrate SPARK activities into our classes. They provide us with examples of activities on a regular basis, simple equipment to try, stories of success and challenge. They support the rest of us as we move outside of our comfort zone and try new things. On Thursday, we had reporters from CTV Barrie and The Globe and Mail join our Orientation day. I think it is a perfect display of our dual focus that one was there to look at our Blended Learning initiative and the other how we use SPARK activities in class to support student well-being. What a great start (before the real start) to the school year! We officially wrapped up our TLLP today. It was bitter sweet. As we looked back at our learning and reflected on the capacity built within our school this year we are flabbergasted. It has been an excellent year for developing a culture of learning and sharing among staff, moving forward in our learning as a group. We were able to personalize learning for all staff to honour all starting points and needs. In June of 2013 we did a “pre” survey and this June 2014 we completed a “post” survey. This survey included all teachers on staff, not just the TLLP core team. Our TLLP was designed to include staff from all areas of the school as we moved through the year. we feel we made a slight improvement in “facilitate and inspire student learning and creativity”. This area was already high. the folks who were proficient in “designing and developing digital age learning experiences and assessments” shifted up to transformative levels, but not many “beginners” moved. This is an area of great need for us. a large shift in “model digital age work and learning”. This area was quite low before this year – we demonstrated impressive gains. substantial improvement in “promote and model digital citizenship and responsibility”. This area was already fairly high. a large shift in “engage in professional growth and leadership”. We were quite low and have shown large improvements. I find it very interesting that teachers feel they have made excellent movement in their own selves as learners in the 21st century and modelling working in the digital age. It makes perfect sense to me that our next area of great need is to design and collaborate on creating ‘digital age learning experiences and assessments’. specific requests for 1:1 expert training and small group setting supports. A shift out of “workshops about specific digital tools” and into “release time to work with other colleagues co-planning” and “attending conferences”. Again, these responses make sense to me and show a further need for co-creating assessment and learning experiences. We began the year focused on the “mechanics of BYOD”. We communicated with teachers that as we head into September 2014 (where all grade 9’s are bringing in devices) that teachers had to have the following four mechanics sorted out, but that they could choose any tools to accomplish these goals that they wished (we provided supports and examples of all the major players). As we moved throughout the year, we focused our efforts more and more away from the mechanics on more on defining what “Blended Learning” is and on creating differentiated assessments and providing descriptive feedback online. As we built capacity throughout the year, more and more teachers wanted to be involved. Our school board Program department graciously supported some additional collaboration (with release time) as we ran out of release time quite early in the year. It sure was an excellent year and our reflection has provided us with some clear direction for moving forward. Many teachers expressed a sadness that our TLLP was at an end. I can honestly say that I have never seen such movement in terms of a large group of teachers transitioning into truly owning and directing their own learning. Each one of our collaborations was guided by participating teacher suggestions and ideas (not my ideas as a the leader, but participating teachers). Thanks to all the teachers who stepped up and were involved in this years TLLP at MSS and PSS!